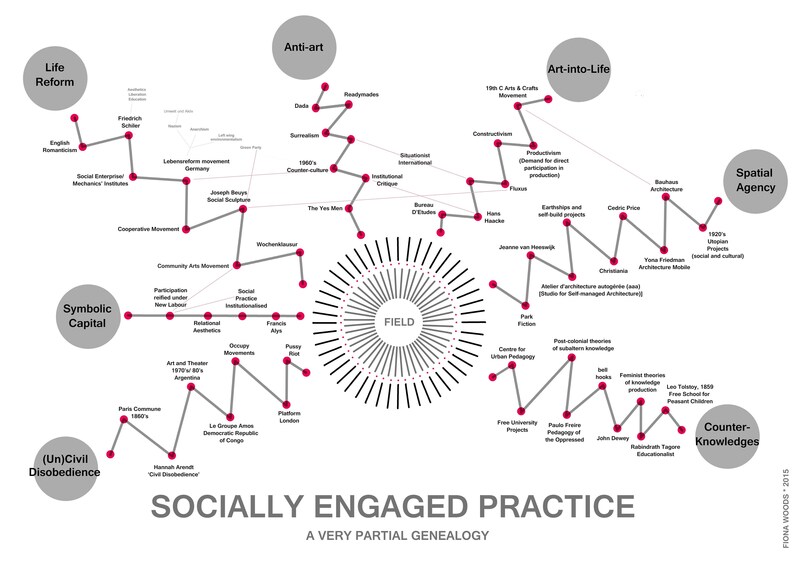 In socially-engaged art, several distinct critical impulses can be identified in the practices of artists. A genealogy of these impulses can be traced through many of the cultural practices that emerged in the modern period, all of which were responding in different ways to tensions generated by art’s contradictory politics as a practice at once autonomous and heteronomous. Theoretical debates framing socially-engaged practices, from community arts in the 1970s up to the present, have been characterised by an antagonism between ethical and aesthetic values. Arguments concerning instrumentalisation and the effects of art also play a role in shaping the choices and decisions that practitioners make. The internal complexity of the practice is set against a matrix of infrastructures and dynamics that constitute the social field. Devising critical tools with which to navigate this multi-layered complexity is an important part of the work. As a practitioner operating at the intersection of critical practices of art and education, I have developed a curriculum based on analysing some of the foundational critical impulses of the practice, to support students in the production of tools appropriate for their chosen approach. Presented here as a diagram, I will consider the implications of two strands in particular: art-into-life and counter-knowledges. Art’s contradictory politics of autonomy and heteronomy is evident in debates concerning the uneasy intersection of art and life, with origins in the philosophical discourse of aesthetics at the end of the eighteenth century. Deeply concerned with the matter of human freedom, Enlightenment philosophers perceived a conflict between the material and the sensuous natures of humans and our capacity for reason, with moral implications. If we are governed by our senses and appetites then we are not really making free, rational choices, they surmised. The idea that sensation and reason might be brought together harmoniously in the form of aesthetic judgement was first articulated by Alexander Baumgarten, laying the foundation of modern aesthetics.1 Kant further developed the idea of judgement as a human capacity, and aesthetic judgement as the means of bringing the sensible world within the scope of reason. The conceptual framework for Rancière’s inquiry is what he calls “the distribution of the sensible”,11 a system of divisions that assigns parts, supplies meanings and defines the relationships between things in the common world, structuring the field of possible experience and expression.12 This distribution of the sensible creates a particular “regime of visibility”,13 which defines the nature of art, including the question of art’s relationship with or separation from life. In the field of socially-engaged art this matters enormously. The socially-engaged artist, by definition, sets out to make art. If Rancière’s analysis is correct, art’s vitality depends on its occupation of an ambiguous condition between autonomy and heteronomy – not-merely-art and not-quite-life. However, the kinds of social relations that can occur in this space are unclear and possibly not what they seem; in a practice constructed around ideas of relationality, this complicates issues of ethics and politics considerably. In 1913, when Marcel Duchamp placed a readymade urinal in a gallery, the act of framing/reframing was revealed as a key aesthetic operation and a critical tool of great significance. This relates to a second argument in Rancière’s analysis which is relevant here, namely that art is uniquely positioned to challenge regimes of visibility. The “re-framing of the real” is equivalent to a “framing of a dissensus”,18 a term which he uses to mean a ‘rupture’ between what we sense and how we make sense of it. The gap between what we sense and how we make sense of it is the crucial site for a struggle between ideology and criticality. Ideology seeks to bridge that gap in a way that conceals it entirely, guarding the internal structures of a given order from exposure to critique, the means by which to “produce the instruments, the elements of intelligibility, which would allow for an analysis and resolution”.19 The gap between what we sense and how we make sense of it is essential to the production of counter-knowledges. “The oppressors,” argued the radical educationalist Paulo Freire, “develop a series of methods precluding any presentation of the world as a problem and showing it rather as a fixed entity, as something given to which people as mere spectators must adapt”.20 As one of the main architects of critical pedagogy, Freire developed pedagogical methods to analyse the constructed nature of social inequality, particularly with those who bear the brunt of it. Freire reframed the classroom as a pre- figurative site for challenging the hierarchical power structures through which social injustice is perpetuated and proposed that knowledge is always a co-creation between people.21 The goal of critical pedagogy is not so much the education of a self as the collective reformulation of what can be seen, what can be thought and what can be said,22 in the interest of emancipation from dominant and limiting structures and norms. Education is a relational matter aligned with common rather than private interest. To retain the category of art whilst simultaneously rejecting that category almost in its entirety, Wright’s theorising of ‘useful art’ sometimes engages in a conceptual acrobatics that has a whiff of mystification to it. A colleague recently wondered whether the whole problem could be sorted more easily by simply replacing the word art with the term craft: socially-engaged craft. However, Wright’s invocation of Marcel Duchamp’s “coefficient” of art – “an arithmetical relation between the unexpressed but intended and the unintentionally expressed”26 – suggests that ‘user art’ sits more comfortably in the tradition of institutional critique, an artistic strategy that attempts to reform (rather than do away with) the institution of art by making visible the historically and socially-specific conditions of its boundaries. Art which looks political may not be the work most likely to create a rupture in the regime of the visible, according to Rancière.29 While socially-engaged art borrows from education and from activism, ultimately it is neither. Its status as a critical practice with pedagogical aspects rests on its capacity to render intelligible matters which may be concealed in the gap between what we sense and how we make sense of it. 1. Andrew Bowie, Aesthetics and subjectivity: from Kant to Nietzsche, second edition (Manchester: Manchester UP, 2003). 2 Friedrich von Schiller, ‘Letter XIV, 1794’, ‘Letters on the Aesthetical Education of Mankind’ in Literary and philosophical essays: French, German and Italian (with introductions and notes), The Harvard Classics (New York: Collier [c1910]), 32. Published online by Fordham University Modern History Sourcebook (www.legacy.fordham.edu). Letters on the Aesthetical Education of Mankind. 5 Terry Eagleton, ‘The Ideology of the Aesthetic’, in ed. Stephen Regan, The Politics of Pleasure; Aesthetics and cultural theory (Bristol: Open University Press, 1992), 24. 7 Immanuel Kant, The Critique of Judgement, trans. Werner S. Pluhar (Indianapolis: Hackett, 1987 ). 8 Jacques Rancière, The Politics of Aesthetics, trans. Gabriel Rockhill, (London and New York: Continuum, 2005); Dissensus: On Politics and Aesthetics, trans. Steven Corcoran (London and New York: Continuum, 2010). 9 Rancière, The Politics of Aesthetics, 25. 10 Rancière, The Politics of Aesthetics, 25. 11 Rancière, The Politics of Aesthetics, 12. 12 Rancière, The Politics of Aesthetics, 12. 14 Rancière, The Politics of Aesthetics, 22. 15 Rancière, Dissensus: On Politics and Aesthetics, 132. 16 Rancière, Dissensus: On Politics and Aesthetics, 119. 17 Rancière, Dissensus: On Politics and Aesthetics, 133. 18 Rancière, Dissensus: On Politics and Aesthetics, 141. 19 Étienne Balibar, ‘Critique in the 21st Century’ in Radical Philosophy, issue 200 (November/December 2016), 11. 20 Paulo Freire, Pedagogy of the Oppressed, trans. Ramos Bergman (New York: Continuum, 2005 ), 139. 21 Paulo Freire, Pedagogy of the Oppressed. 22 Rancière, The Politics of Aesthetics, 13. 23 Stephen Wright, Towards a Lexicon of Usership (Eindhoven: Van Abbemuseum, 2013), 3. 24 Stephen Wright, Towards a Lexicon of Usership, 5. 25 Stephen Wright, Towards a Lexicon of Usership, 3. 26 Marcel Duchamp, ‘The Creative Act’ in eds. Michel Sanouillet and Elmer Peterson, The Essential Writings of Marcel Duchamp (London: Thames and Hudson, 1975 ), 139. 27 Paulo Freire, Pedagogy of the Oppressed. 28 Étienne Balibar, ‘Critique in the 21st Century’, 11. 29 Rancière, Dissensus: On Politics and Aesthetics.